We choose not to eat certain foods because of chemicals and nasties. We choose not to drink certain drinks because of chemicals and sugar. We choose not to use chemical filled make up products. Do you think it’s about time we CHOOSE not to use cleaning products that contain chemicals?! Uhh – yes Merrymakers! You’re here (YAY we love you) because you’re making positive changes to your diet and lifestyle… to become a healthier, happier you. If you’re like us, you started to make changes to your food/diet, then water, then body products. Now, it’s time for us to make a change to our cleaning products. Maybe you’ve made changes the other way around? We hear stories like this ALL. THE. TIME! Either way you’re doing it… go YOU. You’re journey is epic and you are amazing. These lifestyle changes seem to go hand in hand. The more you do, the more positive changes you see, so you keep investigating further, googling more, talking to friends… really, it never will end if you always have a curious mind. Which we say: don’t get overwhelmed by this thought… embrace it and do what you can with what you have! On average, there are over 60 different (probably more) nasty chemicals filling a household’s cleaning products. Yikes! These chemicals are believed to be a major cause of stuff like chronic asthma, skin irritation (we can vouch for this one! ), hormone imbalances, behaviour issues and even cancer and fertility issues. Bigger yikes! Even if it’s not 100% proven… we say it’s definitely not worth the risk. We get it, there’s really no way to escape all the bad chemicals in the world… BUT… we CAN make changes to our own personal lives to decrease our chemical exposure (heck YES for this). Before trying out natural cleaning products we’d read a heap of information about the toxins found in our everyday cleaning products and how they impact our health. We wanted to make the change but we were just a bit unsure of brands/products to use, if they would ACTUALLY work (kind of like our natural deodorant debacle) and how much money we were willing to spend on… cleaning products. To be completely honest, we just couldn’t get out of the habit of using our old products and we certainty didn’t have (or make) time to whiz up our own healthy cleaning products (high fives to the people who do this!). This is why we’re super excited to introduce our new favourite cleaning products… Our Eco Home. We found them via google (searched: best eco cleaning products!’) and we are really glad we bumped in to them. Number one for us is that: the products ACTUALLY do clean! We used to think “If it’s not bleached it’s not clean… right?” OH SO WRONG! Yes, Our Eco Home even have a natural mould spray for the shower and bicarb paste for the oven… that work! There are 9 different products and they replace every single cleaning product we need. This makes it easy to decide what to keep (re: your old products) and what to chuck… ummm, well, it’s time to chuck out ALL the chemical cleaning products. They are an Australian made and owned company run by amazing, passionate people. They’re totally following their bliss. The packaging looks good… it doesn’t look like the typical cleaning product (white, bright brands and… chemical filled!). So you can even leave it out around house (this makes for adhoc inspired cleaning… we DO this now… we kind of think cleaning is fun now… true story!). The products are biodegradable. Tick! 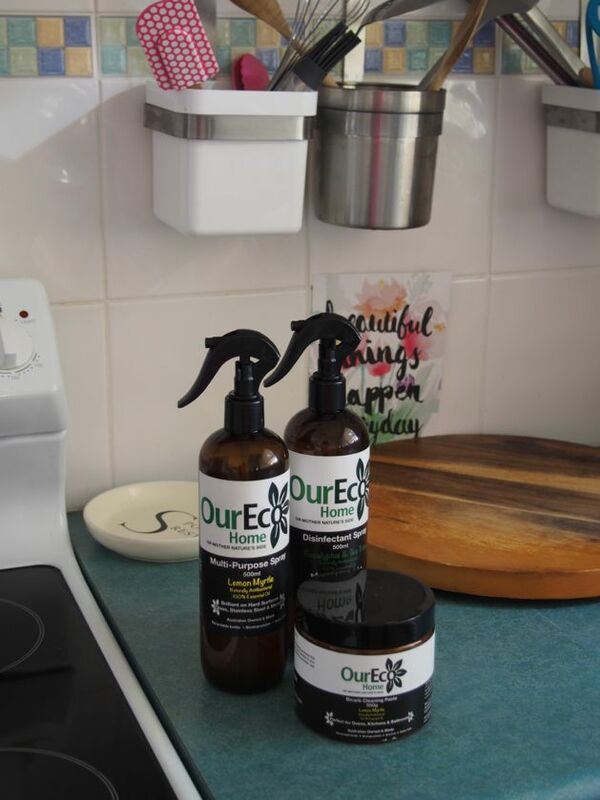 Our Eco Home use essential oils for lovely smells (really… you can use the air freshener for perfume if you want! We may or may not have tried this ;)). There’s a stack of useful videos with heaps of tips to make the transition from chemical to natural cleaning super easy! 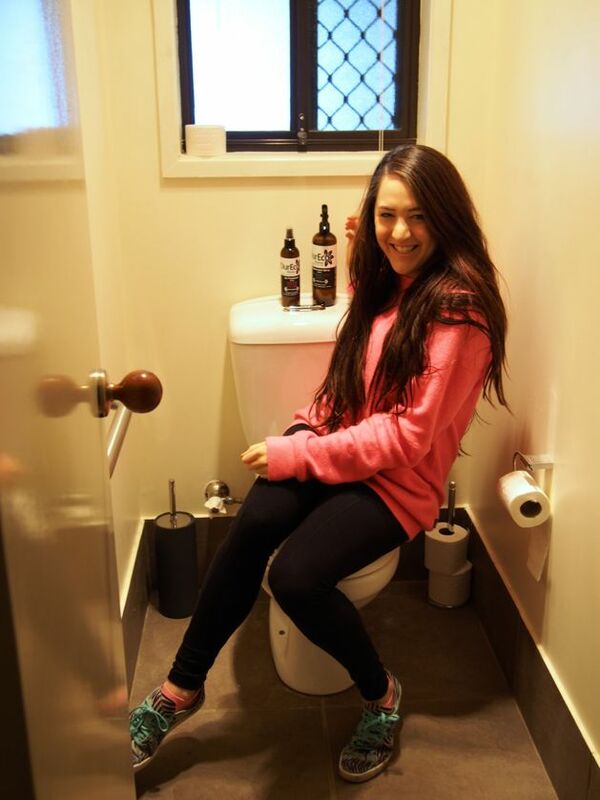 We don’t know how she does it… but Kym makes cleaning a toilet look GOOD! If that hasn’t got you intrigued Our Eco Home products are also cost effective. YAY! No paying extra for all natural cleaning products! 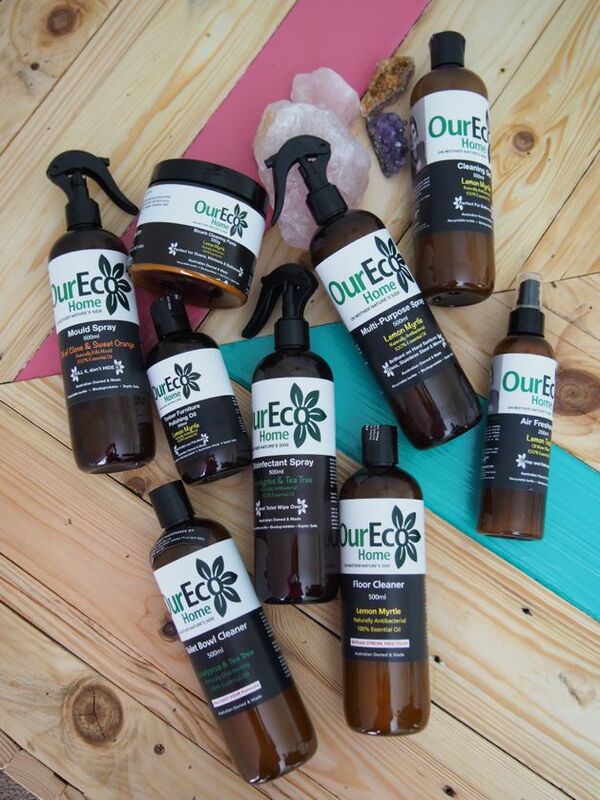 The Ultimate Pack (check it our HERE) is the perfect way to say good bye to all the chemical filled products. The best bit… is that it’s on sale for $79 (was $99) for a limited time (thought you’d like to know!). Always merrymaking and happy chemical free cleaning!